This paper proposes a novel approach with time-invariant transition matrix to predict surface location error (SLE) for low radial immersion milling. In considerations of regenerative and steady cutting thicknesses, the milling process is first concluded as a delay differential equation (DDE). Subsequently, ordinary differential theory is adopted to formulate the response of the machine tool system using the indirect integral scheme. According to Taylor series, the self- and forced-excited term is expanded by linear approximation in turn to deduce a discrete closed map. Taking advantage of this map, a novel transition matrix without any relation to the change of time is established in total tooth passing period to predict the SLE. To verify the effectiveness of the proposed approach, two experimentally validated examples are conducted. The results demonstrate that the method is of higher computational accuracy and efficiency. 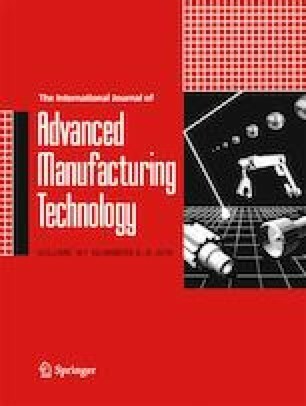 This study was supported by the National Natural Science Foundation of China (51575075) and Collaborative Innovation Center of Major Machine Manufacturing in Liaoning.